A-PDF Scan Paper is a professional desktop utility program that lets you to scan and organize your paper in PDF format. A-PDF Scan Paper provides a powerful ability for scanning and repairing your paper documents. A-PDF Scan Paper uses clear thumbnails and metadata to allow you to easily organize, filter, secure, send and retrieval your scanned documents.Check management in financial/banking industries. * Documents Scanning and Image Import. * Control output PDF size (High Quality, Small File Size (Monochrome), Small File Size (Grayscale)) . * Extensive PDF filter options such as file name, file size, file dates, metadata (Title, Subject, Author, Creator, Producer, Creation Date, and Modification Date). Index and filter PDF documents metadata. * Ability to toggle view (Folder/Tree) of a drive's structure. * Batch add and edit metadata fields. * Text viewer and extractor. * Export PDF information to CSV report. 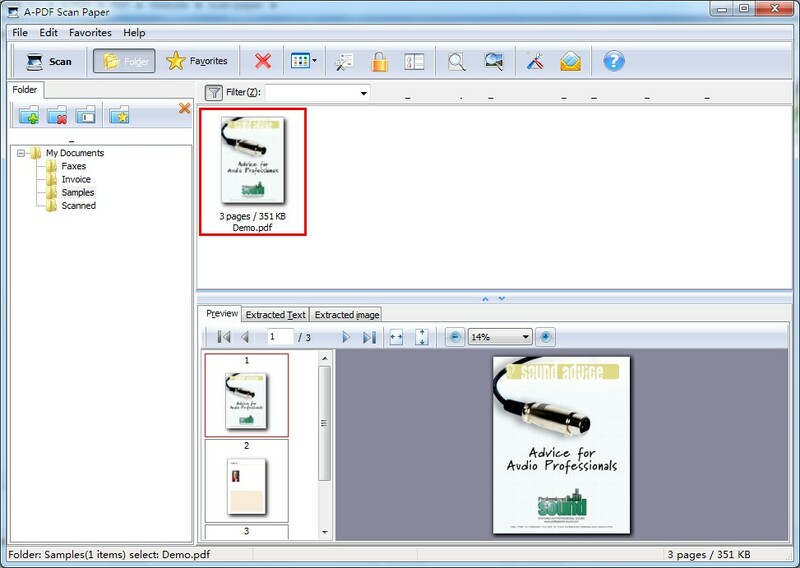 * Raw images viewer and extractor. * Batch tools to modify security. * Batch set PDF open options. * Select multiple PDF files for copying, moving, using windows controls. Scan the documents and then save them with all the sheets in one pdf file. Qweas is providing links to A-PDF Scan Paper 3.5 as a courtesy, and makes no representations regarding A-PDF Scan Paper or any other applications or any information related thereto. Any questions, complaints or claims regarding this application A-PDF Scan Paper 3.5 must be directed to the appropriate software vendor. You may click the publisher link of A-PDF Scan Paper on the top of this page to get more details about the vendor.